A Dutchman sits on the back of an elephant holding a clay pipe in his hands. A band parades in front. They form part of a company that is on its way to the shõgun. 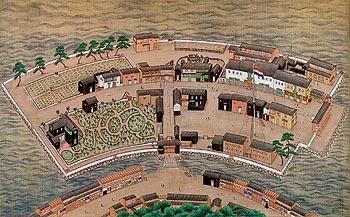 This illustration can be seen in one of the many Nagasaki prints which came in production from around 1750. This production continued for a century. Japanese travellers and merchants who tried to catch a glimpse of the Dutch while visiting the Japanese port town bought these woodcuts with depictions of the 'red-headed barbarians' as a souvenir. In this book more than a hundred of these prints are included in colour. They represent the Japanese perception of the Dutch, who were permitted to stay as the only westerners for more than two centuries in a secluded Japan. The prints present a good idea of the daily life of the Dutch on Deshima. This minuscule island, located in the Nagasaki bay, was the Dutch trading-post since 1641. The Japanese designers invariably portrayed the Dutch big-nosed, red-headed and blue-eyed. They didn’t seem to understand the function of some utensils, which for instance appears from the reproduction of forks, resembling little garden rakes. 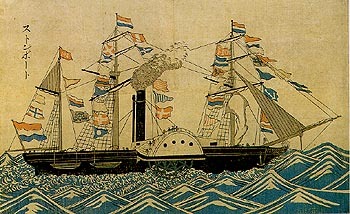 Thus, in a special way a unique chapter in the history of the Dutch overseas comes to life, from the arrival of the Dutch ships and the life of the Dutch on the island Deshima, to the opening-up of Japan in 1858. 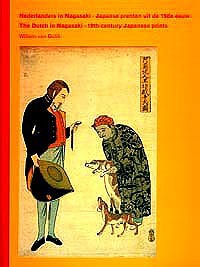 Willem van Gulik, professor of East-Asian Art and Material Culture at Leiden University, has compiled this abundantly illustrated book to mark four centuries of Dutch-Japanese relations. He has placed the Nagasaki-prints in a theoretical framework in which the history, the publishers and the designers of the woodcuts are extensively covered. ISBN 90-73853-10-9, 160 pages, EUR 27,00. - The quality of the reproductions is really astonishing. - The Dutch in Nagasaki is in the first place a beautiful picture-book, with pictures in which the more you look, the more you see. The matching text is very informative and offers the opportunity to place the printings in a historical framework. The city of Nagasaki is building a reconstruction of the island of Deshima and reports about its progress on the web site The Island Comes Back To Life. The site contains some interesting prints.